Several times we have heard or read about the religious muslim events in which ‘Mecca’ is mentioned. However, not very many know what is Mecca? So, in this article we will talk about what is Mecca in the simplest way to achieve a simple understanding. Before talking about what is Mecca?, we have to know where it is located. Mecca is the capital city of the Western Province, it can be located in Makoraba, Saudi Arabia nowadays. Meca is situated in the region of Hijaz, in the west of the Arabian Peninsula and in the east of Yeda, 64 kilometres from there aproximately. Now, to answer what is Meca, we can say it is the pilgrimage place of all muslims that practice Islam. Once a year, during the pilgrimage month, muslims from all around the world go to Meca to do the major or minor pilgrimage. 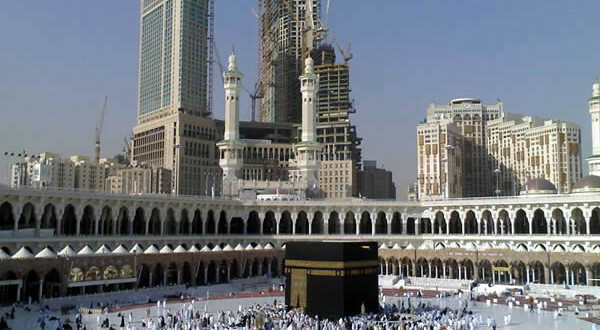 The origin of Mecca is the Kaaba, which is no other thing than a black metallic cube that for practitioners of Islam is the materialization of a monotheistic sanctuary, which according to muslim beliefs was build by prophet Adam and later rebuilt by Abraham and his son Ismael. Another answer given to the question of ‘what is Mecca?’ is that it is the city where Muhammad was born around the year 570, and where he lived until he had to run away due to a religious persecution from which he was subjected in the year 622 approximately. Another answer to ‘what is Mecca?’ could be that it is the place where all practitioners of Islam muslims go because of their religious beliefs since Mecca is where one of the pillars of Islam takes place, pilgrimage. This pilgrimage takes place during one month of the year. This months receive the name of Dhul Hijjah and it is situated in the twelfth calendar. It can also be said that Mecca is where the well of Ismael is, which many muslims believe that the water is has is miraculous. Pilgrimage takes place in the great mosque of Mecca, specifically in a cubic building which is 15 meters tall and almost 12 meters wide, which is covered by a black handkerchief called kishwa. This building receives the name of Kaaba. It is precisely in one of the angles of the Kaaba that the black stone is embedded, which is one meter and a half from the ground. In the year 630, Mecca was released by the Islamic Army led by prophet Muhammad. During the first century of Hegira, the great mosque that surround Kaaba started to be built because of the amount of people that visited it. However, it continued to be enlarged. Mecca suffered several attacks along its History. The first one was Ehiopian, in the year 570, the year in which the holy prophet of Islam was born. Another attack was in the year 929, in this attack the city was assaulted by carmatas, a sect that diverted from Islam. This sect took the black stone that is embedded in the Kaaba. It was 20 years lated that carmatas were forced by caliph Fatimid-al-Mansur to give it back. We we make ourselves the question ‘what is Mecca‘, we may not be aware of how important this place is for muslims who follow Islam, who no matter whereever in the world they may be, they say their prayers five times a day looking at Mecca, so it can be imagined the importance it has for these people. 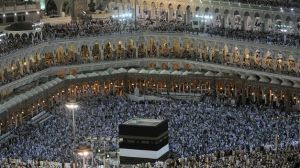 In conclusion, we can say that Mecca is the connection muslims have with their God and the holy place in which through pilgrimage, either major or minor, which counts with several rites, they ask for God’s forgiveness and they follow the way He opens towards him to each muslim. What is Mecca? Mecca is a holy city for Muslims and it is west of Saudi Arabia, being the most important city of the region of Hijaz and one of the most important of the Arabian Peninsula. Many people consider this place ‘the navel of the earth’, ‘the first work of creation’ and also ‘mother of the cities’. This is housed in its very tall place that has a a bond the union of the supreme with the inferior and the nurturing power of the world. This is Muhammad place of birth, Islam founder and it is one of the most important of all the holy cities of Islam. Mecca is visited every year by millions of pilgrims. Muhammad, who was born there around the year 570 and lived in the city until the year 622, moment in which he emigrated due to a religious persecution and fled to Medina. The city of Medina is where he died ten years after his get away and was buried in the yard of his house, which later became in the Prophet Mosque or Masjid al Nabawi Mosque, which is the second most important after Mecca and it is where muslim bend to pray. Before he started preaching, Mecca was a a holy city for all inhabitants, especially for ‘pagans’ because Mecca has many places of religious importance, sucha as Kaaba, which is a sanctuary where the black stone is kept. It is said that this stone was given to Abraham by the Archangel Gabriel. During the Hajj, the greater pilgrimage, Mecca believers have to give seven turns to Kaaba. This tradition tells that Muhammad’s enemies were rumoring about his arrival to Mecca and that muslims were were weak due to high temperature, so Muhammed asked his followers to give some turns round the Kaaba to show they were still strong. This holy mosque is built round the Kaaba. Another of the places of importance of the city is the Grand Sherif Palace and Abraham grave, mine which is the place of the devil symbolic stoning, where pilgrims stone him and then go to Mount Arafat, which is a place for prayer where it believed that prophet Muhammed delivered his last speech. It is also Muzdalifah, a desert where pilgrims spend the night. 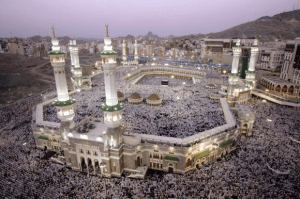 What is Mecca? For muslims is one of the fundamental aspects for their faith, which are the 5 pillars of Islam: profession of faith, alms, prayer, pilgrimage and fast. Every year, almost 3 million pilgrims arrive in the holy city to make a greater pilgrimage, named Hajj, during the muslim month of Dhu al-Hijjah. Other pilgrims can also make a pilgrimage, but lesser, which is called Umrah, and can be made all year round. Non believers, that is to say non muslims, are not allowed to watch the rituals of Hajj since entrance it completely banned for those who do not believe in Mecca and Medina and the punishment is deportation from the country. That is why very few people have been able to watch. We have to highlight that hundreds of pilgrims through the years have resulted injured and even killed by the stampedes and avalanches of fire through the different Islamic factions. Mecca has also suffered several attacks along its History. In the XIII century it was conquered and disrupted by the Egiptians, for later fall under the Turks domain in the XVI century. Is in this mandate that the sherifs (city regents to protect the holy places of Islam and pilgrims) descendants of Muhammad got in charged of the control of the holy city but later were expelled by other sherif, called Husayn Ali, in the year 1916, who later became king of the province of Hijaz. In the year 1924, Mecca was conquered by the Sultan Abd al Aziz ibn Saud, who was the last governor that proclaimed Mecca as the religious capital of Saudi Arabia. About what is Mecca pilgrims give seven turns around the black stone of Kaaba, which is a crucial ritual spot in Mecca. The pilgrim lays his hand on the stone to oath obedience and faithfulness. One of the basic pillars of Islam is pilgrimage to Mecca. During pilgrimage, muslims have to turn starting in the black stone and finishing also in it. The turns must be made counterclockwise, it means from left to right, as prophet Muhammad taught. All these rotations are similar to others, such as earth rotation around itself, the rotation of all the planets around the sun, the rotation of the twister, the rotation of the electrones in their 7 orbits around protons (nucleus of the atom), blood circulation in the Human body or the sperm around the ovule and many others that have this same variation. In Ancient times, neither the earth movement nor the sun, the galaxies were not known as we know them nowadays, but it is said that Allah knows everything since He is the creator of every single thing on Earth, that is why rotation takes place in different areas. This ring road in the pilgrimage reproduces the movements that exist in the universe, from the smallest to the biggest. It is like that that gatherings can be seen around the Kaaba, the same as the image of the galaxy in its form, movement, tendency and everything that in is orbit circulates from left to right. History of Mecca is too long, so we have tried to do a complete summary of what is Mecca and the functions is has with Muslims are very many. We will be publishing more articles about Mecca and its History.